Something tells you that a monster should be scary, but if you’ve ever seen Monsters Inc. or the kind of cute-looking monsters in this 3x3 new online slots game that is only out to win you cash, you’ll realise that there's very little to fear. 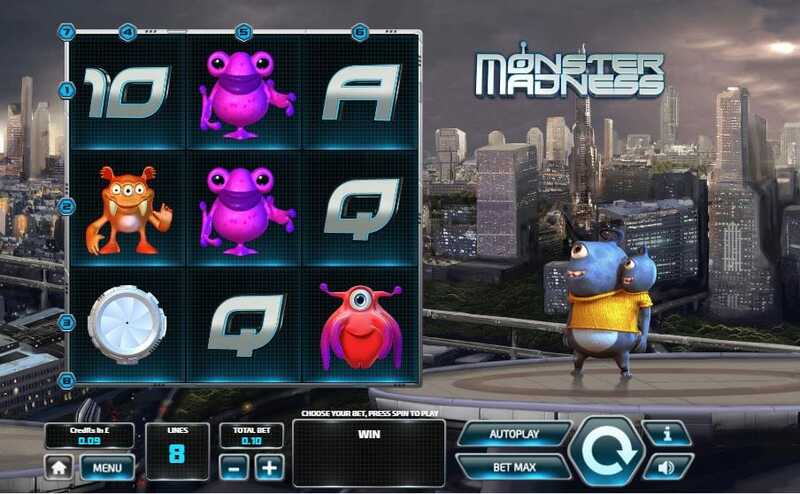 Monster Madness is a fun little slot game with plenty of smiles across the reels and plenty of different ways to pick up some monster wins, too, with a few special features and bonuses on offer, here. Slots Baby features some great arcade no deposit slot game. Tom Horn Gaming is developer of this game are this developer has a growing catalogue of fun games to it’s name. Often with their own sense of humour and involving some loveable characters - see, Don Juan’s Peppers - Tom Horn games often put fun first. This is a symptom of the developer being ran by people who genuinely love to play this games themselves and that really comes across in the majority of games they put out. All of them very well-designed, very well animated, playable and, as mentioned, more often that not they are not taken too seriously, either. Slot games are just games, after all! Visit our slot promotions page before you play the game! In the background you’ll see cityscape of the city that these monsters call home. Tall buildings and smoky clouds make an atmospheric backdrop - the sort that you predict that something scary may happen within - but these monster, don’t bite. Some have big teeth, though, so don’t tempt them. There are 8 pay lines to work with here, with the betting scope being one that is more suitable for penny better than high stake rollers. Betting from 0.02 to 1.00 is the full range here, so that plays into this being the sort of game where fun takes the priority over gambling, which should always go hand in hand. 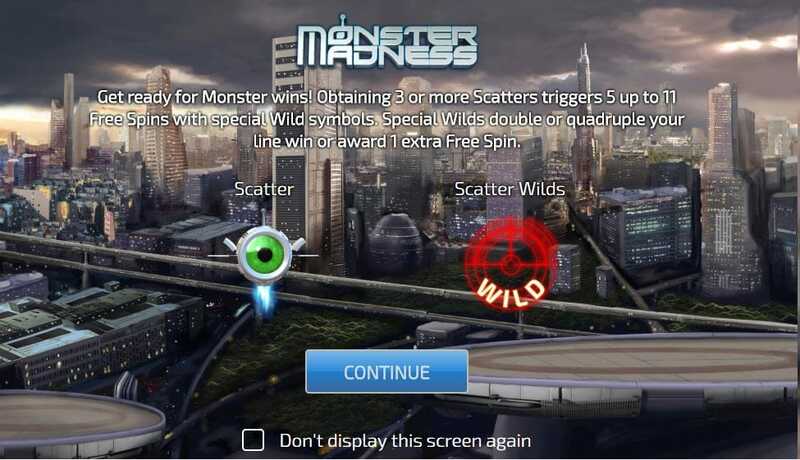 The wild symbol in Monster Madness is the computer graphic which looks like a target. If you hit 3 of these them, you’ll get 60x your bet and what’s more is that this symbol can swap out for all other symbols apart from the scatters. The big green eye is a useful symbol and when hit 3 or more of them, you’re going to be regarded with some free spins. You will get 5 free spins for the minimum of 3 symbols but if you hit more than this you get 1 more free spins for every symbol on the screen, so the free spins could yet keep coming. It’s even possible to fill the whole screen with these symbols for a pretty monster-sized 200x your bet wins.